Norfolk tells Cromwell that the King will grant him an audience. Born in 1960, Rylance trained at The Royal Academy of Dramatic Art under Hugh Cruttwell, and upon graduating in 1980, the Glasgow Citizens Theatre gave him his first job; a year in repertoire, a trip to the carnival in Venice with Goldoni, and an Equity card. Now considered one of the greatest actors of his generation, Rylance is a master of both stage and screen acting and has also written and directed for the theatre. Between 1996 and 2006, Rylance served as the Artistic Director of Shakespeare’s Globe Theatre, and in 2007, he wrote his first play, I Am Shakespeare, which premiered at the Chichester Festival Theatre. During his career, Rylance has acted in 52 productions of plays by Shakespeare and his contemporaries, with iconic performances including Olivia in Twelth Night and the title role in Richard III. In 2009, Rylance lead the original cast of Jez Butterworth's play Jerusalem in the role of Rooster, and was subsequently recognised with both the Olivier and Tony Awards for Best Actor. Rylance's performances onscreen include; Days and Nights, Anonymous, The Government Inspector, The Grass Arena, Love Lies Bleeding, Intimacy, Angels and Insects, Nocturne, and Institute Benjamenta by the Brothers Quay. Away from his performances, Rylance is an honorary bencher of the Middle Temple Hall in London; trustee of the Shakespearean Authorship Trust; an ambassador of Survival International, the movement for tribal peoples; and a patron of Peace Direct, working for non-violent resolution of conflict. 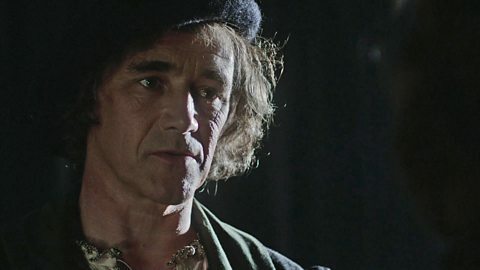 BBC History: Thomas Cromwell - a very modern politician?